Impressive demos of HTML5-based wizardry may be more common than ever now, but that doesn't mean there isn't still room to be impressed. One of latest to raise the bar is the One Millionth Tower documentary from the National Film Board of Canada's Highrise project. The main feature itself runs just over six minutes if you choose to simply sit back and watch, but things get quite a bit more interesting if you dive in and explore the highrise neighborhood that's the focus of the documentary, which is realized in WebGL-based 3D environment. Naturally, there's also a behind-the-scenes look at how the documentary was made, and the NFB has even made the source code available for those that want to dig deeper. Head on past the break for the trailer, and hit the source link below to check out the full thing for yourself -- we'd recommend switching your browser to full screen mode for the best experience. One Millionth Tower documentary elevates the art of HTML5 originally appeared on Engadget on Sat, 12 Nov 2011 08:33:00 EDT. Please see our terms for use of feeds. Japan has typically had exclusive access to Sharp's skinny and big-screened smartphone series, but that could soon change. Details of the Aquos SH-01D have now appeared in the FCC's bulging mail box, a phone packing a dual-core 1GHz processor and a glasses-free 3D 4.5-inch screen. Add in water resistance and a whopping 12.1 megapixel camera, and you can see why it's piqued our interest. The phone is already booked to make an appearance in Japanese NTT DoCoMo stores later this month in blue, white and black options. Of course, despite Sharp's application for an FCC nod of approval, the company may have no intentions of selling it on US soil. We'll keep our phone-hungry fingers crossed that it gets okayed for overseas travel. 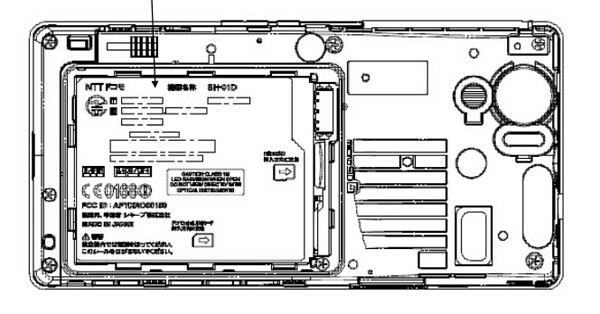 Sharp's splashproof Aquos SH-01D arrives at the FCC's door, won't shut up about its 12.1 MP camera originally appeared on Engadget on Fri, 11 Nov 2011 13:17:00 EDT. Please see our terms for use of feeds. They're being hailed as the first button-free, touch screen heart rate monitors, with Oregon Scientific and Gaiam teaming up to produce the wearable SE338M and SE336. According to the companies, these things are a scant two millimeters thinner than any competing product on the market, and they've even captured an International CES Innovations 2012 Design and Engineering Award in the Health & Wellness category. Looking more like a watch than a fitness / health tool, the Touch line supports both wrist and chest-worn options, utilizing ECG technology that requires but a single touch of the finger on the monitor's sensor for an accurate heart rate reading. For those eying the strap model, that one operates in digital and analog modes and tracks fat burned, though the strap-free model will also track calories burned and heart rate data. 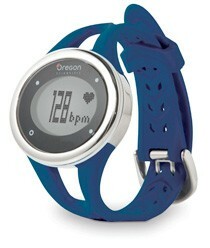 Predictably, you'll also find a stopwatch, zone alarm, clock and calendar, and those itching to find a stocking stuffer this early can plop down $99.99 to $109.99 right now at the Oregon Scientific Online Store, Target, Sports Authority, Academy Sports, MC Sports and Athleta. Oregon Scientific trots out Gaiam Touch button-free heart rate monitors originally appeared on Engadget on Fri, 11 Nov 2011 15:56:00 EDT. Please see our terms for use of feeds. If it feels like everyone is making a MacBook Air competitor these days, you're right. 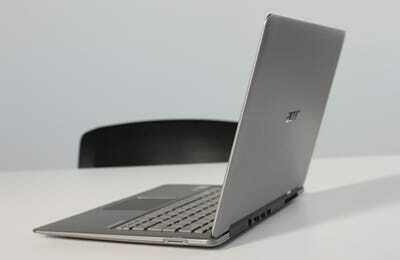 PC makers are really pushing the new "Ultrabook" category, playing off the Air's massive success. Acer is one of the first to crank one out. Read on to see what I thought. When I first pulled the Aspire out of the box, I was pretty impressed. It's heavier than my MacBook Air, but still felt solid and well-built. Then I opened the lid. First, the screen hinge is pretty loose. When I'd rest the Aspire on my lap while sitting on the couch or in bed, it'd flip open to the point it was almost flush with the bottom portion. That got really annoying when trying to do work or watch a movie on Netflix. The keyboard was a real bummer. The pebble-sized arrow keys are difficult to hit, which normally wouldn't be a problem except the Aspire uses them to control volume and brightness. That makes it a huge pain to adjust those settings. And while the rest of the keyboard felt normal, the keys are still cheap and plasticky. It's nowhere near as nice as the typing experience on the MacBook Air. I'm not a huge Windows fan, so I won't spend time griping about the typical annoyances of bloatware, malware, and other nasty stuff. Just know you're getting Windows 7 and all the problems that come with it. First of all, boot up time was atrocious. 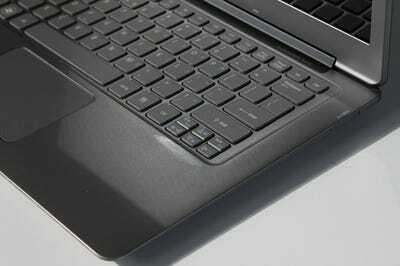 Part of the allure of all these new Ultrabooks is supposed to be rapid bootups and app launches. Instead, I had to wait over a minute to get to the desktop after switching the Aspire on. Compare that to the 15 seconds my MacBook Air takes to get cranking. The Aspire's battery life is no better. 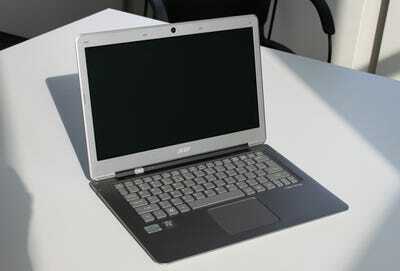 According to Acer, the battery should last up to seven hours. It didn't even come close to that for me. I was able to squeeze out four hours, tops. Pretty disappointing. Maybe I'm just spoiled by the spot-on accuracy of the MacBook Air's touchpad, but the Aspire's trackpad is an abomination in comparison. Two-finger scrolling is there, but it's hardly perfect. The cursor doesn't sit still when scrolling, so I was forced to switch back to one finger and reposition it on my screen so I cloud continue. Annoying. Eventually I got fed up and started using clicking on the scrollbar's arrows to navigate web pages. It felt so 2000. On the upside, I was happy to see Acer added an HDMI port to the Aspire, something I think too many laptops and other Ultrabooks are missing. If you like to use your computer to store a bunch of movies, or turn it into a streaming Boxee player, the HDMI port is a giant plus. I wish my MacBook had that. The Aspire S3 starts at $899, which is a lot more attractive than the hefty price of the $1,300+ 13-inch MacBook Air. Still, I'm not sure the cheaper price makes up for the equally as cheap build quality and other annoyances mentioned above. 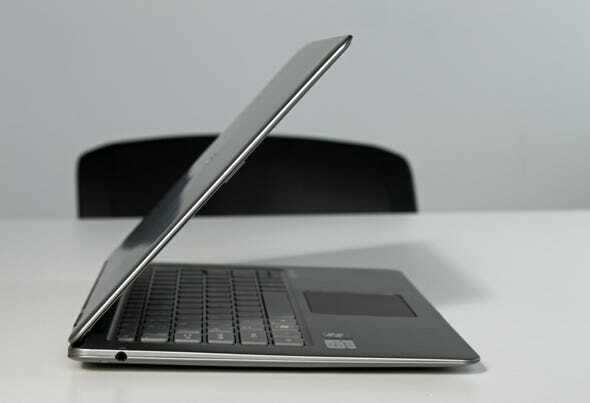 There are plenty of other great Ultrabooks out there from Asus, Samsung, and Toshiba. They may be pricier, but you can bet they'll last longer. It's easy to become jaded when you review as much cutting-edge hardware as we do. We try not to be curmudgeons, but we do get grumpy when next-gen hardware fails to make a leap in performance-or worse, when it falls behind the gear it's intended to supplant. So we're happy to report that benchmarking Netgear's new WNDR4500 left us grinning from ear to ear. This is the fastest router we've ever tested, and it's packed with new features. Netgear continues to brand its wireless routers with two different model numbers. The WNDR4500, for example, is also marketed as the N900, presumably because this is a dual-band model that's capable of supporting three 150Mb/s spatial streams on both its 2.4- and 5GHz radios: Three times 150 equals 450, and 450 times two equal 900. That's nonsense, of course, because the two radios can't be bonded to serve a single client. It's also unfortunate, because this router is so fabulous it doesn't need to be hyped. The WNDR4500 is dramatically faster than the older WNDR3700, which supports only two spatial streams on each of its frequency bands. At close range, the WNDR4500 achieved TCP throughput of 151Mb/s on its 2.4GHz radio, and a staggering 251Mb/s on its 5GHz radio. Compare that to the WNDR3700's 84.3Mb/s and 175Mb/s performance, respectively. The new router beat the old by a wide margin at every test location with the notable exception of our media room, where the WNDR3700's 5GHz radio beat the WNDR4500's by 27 percent. Interestingly enough, the WNDR3700's hardwired switch also proved to be slightly faster than the one on the WNDR4500, with the old router outperforming the new by 11Mb/s (887Mb/s versus 876Mb/s). The WNDR4500 is the first router we've seen to boast USB 3.0 ports (two, to support both a storage device and a multifunction printer). 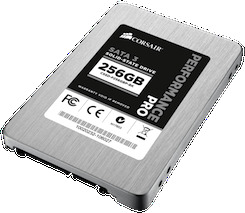 This is a long overdue development, but we encountered a curious anomaly when we performed our NAS benchmark test, using a 500GB Western Digital My Passport USB 3.0 drive: The WNDR4500 was more than twice as fast as the WNDR3700 when writing files to the portable drive, but the WNDR3700 was significantly faster when reading files from it. Netgear has completely revamped the router's browser-based user interface, although you won't need to access it right away: The default SSID for the 2.4GHz radio and a unique, but easy-to-remember password for both radios (ours was "magicalfire673") are printed right on the side of the device. Simply add "-5G" to access the 5GHz network. You're free to change any of the SSIDs or passwords, of course. You can also operate password-optional guest networks on both radios, with the ability to restrict guests to Internet access only, access to the Internet and other clients on the same SSID, or access to your entire network. Netgear has come up with a free newb-friendly client app called Netgear Genie that's very similar in functionality to Cisco's Network Magic. You can control most aspects of the router's settings with this tool, display network maps, establish parental controls (administered via OpenDNS), monitor your bandwidth consumption, and more. Aside from the oddly slow USB read performance-and the absurd "900" branding-we can't find a single flaw in the WNDR4500. If you have the budget, this is the router to buy. 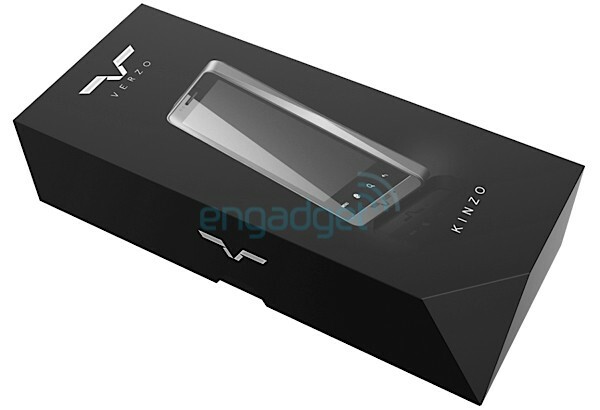 Remember the Kinzo, that mysterious Android smartphone from Verzo we teased you with this past summer? Well it looks like the Americano Czech company just launched its stylish, custom-skinned, FroYo-powered (?) device. Originally slated for a late-September release, the 12.3mm-thick handset -- designed by Novague -- goes on sale today on Verzo's website for $459 (€420) contract-free. This buys you a 4.3-inch WVGA glass-capacitive TFT display, a 1GHz TI OMAP 3630 processor, 512MB of RAM, a five megapixel AF camera (with LED flash), a VGA front-facing camera, tri-band UMTS support (AT&T-compatible), quad-band GSM support, WiFi b/g, Bluetooth 2.1+EDR plus the usual array of sensors. Power comes from a 1590mAh battery, and a microSD slot provides storage (an 8GB card is included). No word yet on essential features such as a compass, HSPA, or support for the Android Market. The manufacturer plans to differentiate itself with free shipping, refined packaging and a full set of bundled accessories, including a leather case, quality headphones, a car charger and a car holder. While details about the Verzo GUI remain vague (tweaks appear to be primarily cosmetic), each Kinzo will include offline navigation software by Sygic. An app called TellME will provide "the basic means of communication between the users and the Verzo brand". The company wants to establish a strong relationship with its customers by letting the community of owners suggest and vote on improvements to its product. Winning features will be incorporated into the next software update. Curious about this elegant mid-range Android smartphone? Check out the picture gallery below, and hit the break for the full specs, a promo video, and the obligatory PR. Verzo launches Kinzo Android smartphone, on sale today for $459 originally appeared on Engadget on Fri, 11 Nov 2011 08:00:00 EDT. Please see our terms for use of feeds. You can't expect to see one for "one to two weeks," but those hellbent on holding out for an unlocked iPhone 4S here in the US of A can finally snag one without jetting off to Australia (among other places). Nearly five months to the day after Apple started selling the iPhone 4 in unlocked fashion in the States, the iPhone 4S is joining the club, with a 16GB model going for $649, a 32GB model for $749 and a 64GB variant for $849. Just so you're aware, the unlocked phone enables you to use any micro-SIM from any GSM carrier worldwide, but it won't play nice with CDMA carriers "such as Verizon Wireless or Sprint." And yes, both the black and white versions are up for order. Hit the source link to part ways with your chosen amount of cash. Apple's US online store begins selling unlocked, contract-free iPhone 4S: $649 and up originally appeared on Engadget on Fri, 11 Nov 2011 09:35:00 EDT. Please see our terms for use of feeds. Steam, an Internet gaming service, was compromised by hackers this past Sunday, reports the BBC. The service boasts 35 million users, which makes this an especially serious exposure of data -- the hackers illegitimately accessed a database containing credit card info and users' personal information, such as billing addresses, passwords, and purchase history. 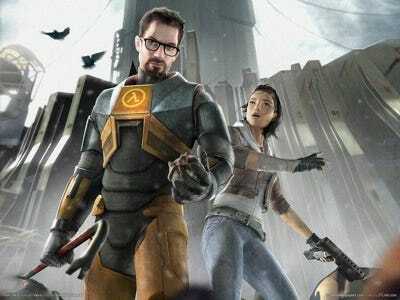 Valve, the company that owns and operates Steam, issued a statement saying that it saw no indications that the exposed credit cards were being used illegitimately. Mark Zuckerberg: "I'm Pretty Sure We're Not Going To Build Any Games"
Unless your name rhymes with "Anksy" or you've got the chops to do burners like this, you might want to consider a less...permanent means of expressing yourself in the public space. The Light Spray Can might just be the answer. Instead of spraying paint, the Light Spray Can emits a high-intensity beam of UV light. When combined with long-exposure camera shots, you can achieve stunning light-painted results. In addition to the spray-can shaped UV light, the kit includes letter stencils and a UV-sensitive backdrop that holds the light longer, allowing for more intricate works. The Light Spray Can runs on a single AA battery and retails for $39 at Photojojo. SandForce-equipped SSDs are seemingly all the rage nowadays, but lest we forget that others, like Marvell, have some peppy controllers of their own. Step up Corsair, who's just announced its new Marvell-equipped line of SATA 3 Performance Pro Series 6Gb/s SSDs. These 2.5-inch storage slabs can achieve 515 MB/s read and 440 MB/s sequential write speeds, and sports a TRIM-like "built-in advanced background garbage collection," which company deems helpful for RAID setups. Notably, desktop users will be pleased to know that the drives will mount into 3.5-inch slots via an included adapter. If you're interested, $280 will snag you a 128GB version, while $530 doubles the capacity to 256GB. 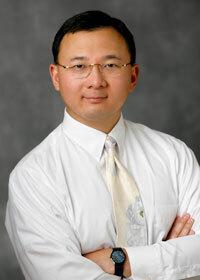 You'll find more details in the press release past the break. Corsair unveils Performance Pro Series SSDs, loads 'em with 6Gb/s Marvell controllers originally appeared on Engadget on Thu, 10 Nov 2011 17:33:00 EDT. Please see our terms for use of feeds. Honda fans, hope you're down for some last-minute tickets to Japan, as the automaker plans to release not one, but seven (!) stunning concepts at the upcoming Tokyo Motor show. Ranging from plug-in hybrids to electric motorcycles, we're most stoked about the Small Sports EV -- a dashing two-seat roadster that reminds us stylistically of BMW's i8. Details are light, but Honda promises that it'll be fun to drive, yet also achieve "excellent environmental performance." Alongside it is the plug-in hybrid AC-X, which looks like an LED-ridden redux of the lease-only FCX. And finally, there's the Micro Commuter concept, which despite looking the least production-ready of the three, gets kudos for having a dedicated spot to load the accompanying Motor Compo EV motorcycle. Not much else to report on all seven this far out, but that doesn't mean you can't ogle at photos of these three and their motorcycle brethren at the links below. Honda's Small Sports EV concept proves electric can be svelte, comes to Tokyo Motor Show next month originally appeared on Engadget on Thu, 10 Nov 2011 19:44:00 EDT. Please see our terms for use of feeds. You might not need an electric streetbike in the near future, but it's still cool to know that the prototype is complete. CRP Racing has just introduced the Energica at the EICMA motorcyle show in Italy. The Energica slides an all-electric powertrain with 100kW of power into a classic Italian-style two wheeler the is capable of speeds up to 220 km/h, 16kgm of torque, and 150km of range on a single charge, features OZ forged aluminum braking discs and a power train efficiency around 95 percent. The niftiness is only compounded by front double caliper radial mounts, a single rear fixed caliper, digital multifunction LCD dashboard and LED headlights. Pricing begins with a deposit of €1,500 ($2042 US) and doesn't include VAT. 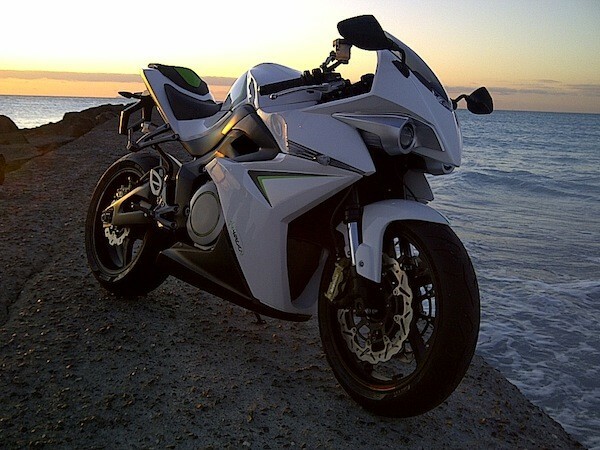 Of course, the Energica is still in the development phase, so final pricing and specifications might change. Still, if an electric streetbike isn't at least as cool as a penguin in a freezer, then something's wrong with your freezer. CRP Racing debuts Energica electric streetbike prototype at EICMA 2011 originally appeared on Engadget on Thu, 10 Nov 2011 22:48:00 EDT. Please see our terms for use of feeds. After announcing that it would completely revamp its struggling TV business after yet another quarter of financial setbacks, what's next for Sony? CEO Howard Stringer tells the Wall Street Journal that R&D is focusing on a "different kind of TV set." He didn't specify whether he was talking about the company's efforts with Google TV or any other technology, however he did note the "really well organized" beauty of the iPhone and said that after a five year quest to build a platform that would compete with Steve Jobs, it's finally ready to launch. This all hinges on Sony's ability to pull its four screens (phones, tablets, PCs, TVs) together with network services like Video Unlimited and Music Unlimited (and hopefully make those Qriocity-birthed offerings famous for something other than being a footnote in its hacking scandal). Sony has finally begun to acknowledge its weaknesses in software and providing a uniform user experience, we'll probably find out more about how it plans to turn that around a! t CES 20 12 in January. Sony's CEO is ready to launch a four-screen platform 'that can compete with Steve Jobs' originally appeared on Engadget on Fri, 11 Nov 2011 01:05:00 EDT. Please see our terms for use of feeds. 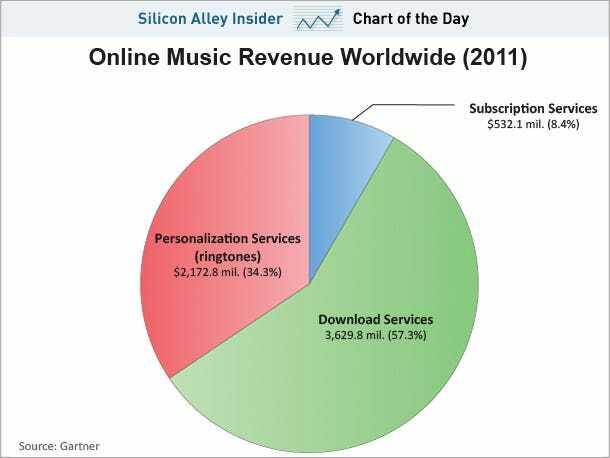 Here's a breakdown of online music sales from Gartner, by way of Peter Kafka at All Things D. The most insane thing about this chart? How important ringtones are. "To sum up: More than 10 years after Napster, one of the key pillars of the music business is ringtones, a business that peaked around 2005, when some of you would have recognized the image at the top right of this post. If you’re reading this, you probably haven’t paid for a ringtone since 2007, and you probably don’t know anyone who does. But there it is, generating two-point-one-billion dollars." Don't look now, UKers -- but you've got yet another option in the burgeoning world of all-in-one PCs. Thrilling, we know. Packard Bell has just issued the revamped PB oneTwo, an all-in-one PC line that may very well end up referred to as "PB 12" in your domicile. Nomenclature aside, this freshened up device is a full 65 percent slimmer than the one your mate purchased two years ago, giving you 65 percent more reason to brag about it once you've taken delivery. It's available in 21.5-inch and 23-inch flavors, with Intel's 2nd-generation Core i CPU family, NVIDIA or AMD graphics, a pair of 2.5-watt speakers, two USB 3.0 sockets (along with four of the slower USB 2.0 variety), an optional Blu-ray drive, up to 8GB of DDR3 memory and a 1,920 x 1,080 display on the both of 'em. You'll also get a 2 megapixel webcam, multi-format card reader, optional (seriously?) WiFi / Bluetooth, gigabit Ethernet and a bundled keyboard and mouse. The PB oneTwo M (21.5-inch) and PB oneTwo L (23-inch) will ship later this month for £599 and £699, respectively, though there's no word on availability beyond the Queen's backyard. 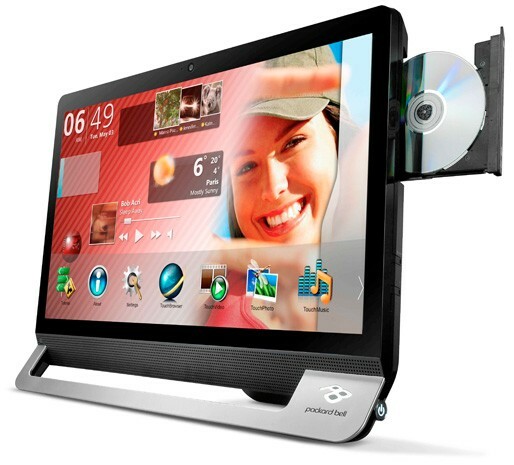 Packard Bell trims the fat on PB oneTwo all-in-one desktop PC line originally appeared on Engadget on Thu, 10 Nov 2011 11:19:00 EDT. Please see our terms for use of feeds. We barely recovered from Nokia's futuristic concept buffet at Nokia World, but a new video has unearthed the deceptively named Humanform. Fortunately not shaped like a dolly, this teardrop device cooked up Nokia's in-house labs supposedly uses some as-yet unexplained nanotechnology, with a bendable transparent display and a fully touch sensitive casing. The segmented design also channels some Wiimote-esque gesture features and twist controls seen on the phone behemoth's Kinetic Device. An inert Humanform shell was also on show alongside it last month, although it didn't do much aside from bending. See if you agree with Nokia's vision of the mobile future after the break. 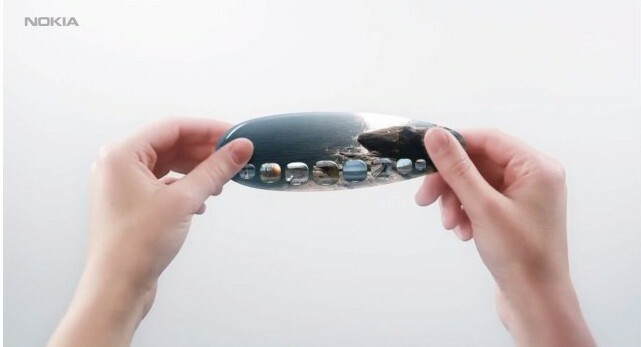 Nokia's Humanform concept phone, not shaped like us (video) originally appeared on Engadget on Thu, 10 Nov 2011 11:42:00 EDT. Please see our terms for use of feeds. What is the optimal size for a modern-day tablet? Is it 10 inches? Is it seven? Or, is it something smaller, like the economy-sized smartphone that is the Galaxy Note? We can't say for sure, but we surely can say that Samsung is as much in the dark as we are. Like a gadgety Goldilocks traipsing between an endless sea of options, that company seems completely unable to make up its mind, splitting niches into sub-niches and then cleaving those in twain again with a seemingly endless array of fractionally different tablets. Today we're looking at the Galaxy Tab 8.9. This powerful slate exists because, apparently, the Galaxy Tab 10.1 is too big and the Galaxy Tab 7.0 Plus is too small. Is the $449 8.9 just right, then? Read on to find out. 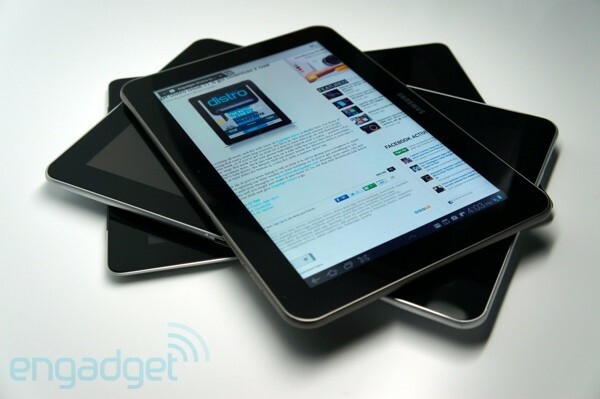 Samsung Galaxy Tab 8.9 review originally appeared on Engadget on Thu, 10 Nov 2011 12:00:00 EDT. Please see our terms for use of feeds. drag2share: The USB Watch is so Geeky!